Every other year my kids have a big birthday party with all their friends at the place of their choosing. On the off years, we have a smaller family birthday celebration. However, I still like to plan a few fun festivities on their birthday and who doesn't LOVE a pinata??? 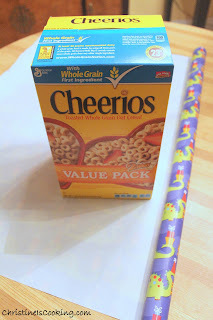 Empty cereal box (any cereal box will work. I chose a double box of Cheerios. The cardboard was nice and sturdy). (1) Fill your cereal box with your pinata goodies (candy, small toys, etc). Close the box using the tabs. You don't want to close the top too securely, because upside will be downside and this will be the bottom of your pinata and you want it to eventually open when it is hit. (2) Wrap your cereal box with wrapping paper. Again, when wrapping over the open end (i.e. now your bottom) secure it with only a few small pieces of tape so it will eventually open. 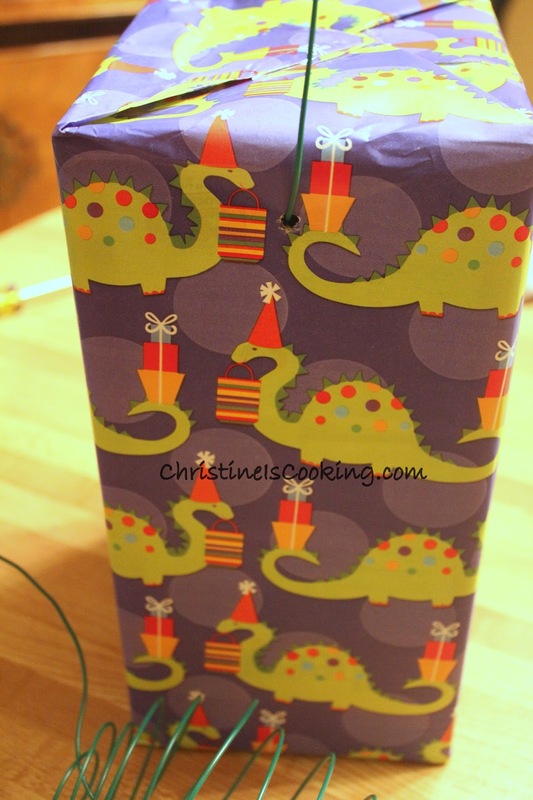 (3) Using a screw driver poke a hole on 2 sides of the top of the pinata (the closed end). Thread a piece of landscaping wire in one hole and out the other. This is what you will use to hang your pinata. I made the hole on the side where the string was coming out a bit bigger so it was easy to thread it through. (4) Decorate the pinata as desired. I added streamer paper secured with tape onto the top and bottom on the pinata. I fringed it by folding the streamer paper several times and then cut it with scissors. UPDATE: I am happy to report the homemade pinata was a hit at our party. It took 19 hits from some very strong 6 - 8 year old children to crack it open. 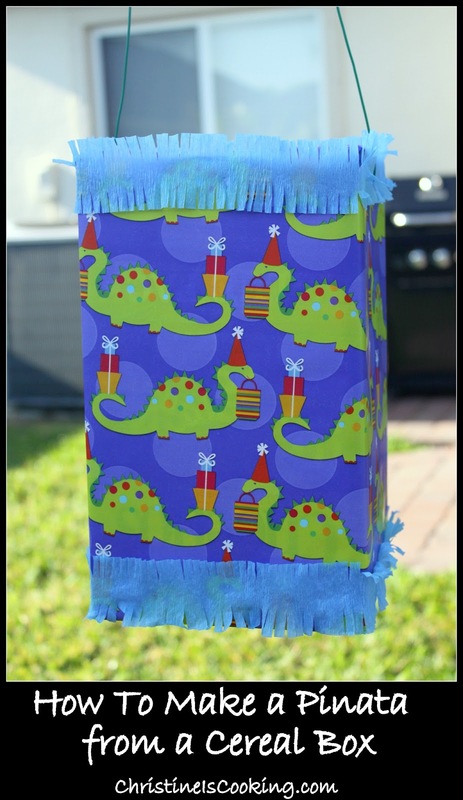 Thank you for sharing this diy pinata! I am going to use this as a reference to making one for my daughter's birthday party! I make piñata's nearly every year for my family campout, some years up to three, due to varied ages, my adult kids Love them too. I am real tired of the mess and time it takes to do them with paper mache' and we are down to just 5 younger kids,(big kids get a different game this year),so I am using a similar plan, with a bit sturdier box am wrapping it with white wrapping paper, but using tissue squares to cover the body of (Sponge Bob),pipe cleaners for arms and legs and large googley eyes surrounded by blue tissue, pipe cleaner frame for his nose and I think an old knee high nylon, cut and filled with tissue will work for the hands and feet then tissue them black (that will also prevent any sharp ends of pipe cleaner to be exposed. I am using a hole punch for the holes reinforced with tape inside and gossamer ribbon for hanging, as I have some, without buying wire. There are endless possibilities. I will share one not to use. I had been sick one year and was going to skip piñatas, but decided last minute, I could use gift bags, but they weren't strong enough so I lined the inside with duct tape, a little for the younger group and fully lined for the big kids. they were never able to break them. Some of the guys kept trying, but we ended up ripping the tape off the tops and dumping the contents. Masking tape maybe, but not duct tape!